Most reviewers recommend the Adidas D Rose 4 when playing outdoors. The flat and thick rubber outsole combined with the multidirectional herringbone pattern deliver great traction during gameplay. A lot of Adidas basketball shoe owners advise new buyers to go true to size. Many purchasers commend the technologies used in the shoe. These technologies make it lightweight without compromising the performance. Plenty of buyers are in awe over the bold design and two-tone colorways of the shoe. Multiple owners appreciate that there is space in the forefoot area, allowing the toes to flex well. They say it reminds them of Dame Lillard’s fifth Adidas basketball shoe. There are a handful of users who say that the shoe runs small. A few conclude that it fits like Nike’s 11th signature shoe for Kevin Durant. Some users complain about the tongue of the shoe. They say that if the shoelaces are tightened to achieve their designed lockdown, the laces can be felt stinging the skin. In these cases, some buyers wish for the 33rd Michael Jordan shoe with a FastFit system. Overall, the Adidas Rose 4 is loved by many. This shoe is almost close to perfection. With the technologies used on the shoe, Adidas almost cannot go wrong with its design. At $140, it has the right amount of every shoe attribute an athlete can demand for. If you are a basketball player in a guard position, the D Rose 4 is meant for your gameplay. Wasn’t too thrilled with playing in a shoe that was so similarly setup to adidas’ other most recent models but I did really enjoy the small tweaks that you can’t really see but can feel. Adidas did a good job with these. To say it is one of the best of the year is a given, but what is impressive is that this shoe brings the line close to the 1.0/1.5 in terms of an aggressively raw shoe. The Adidas D Rose 4 is the shoe model released after Derrick Rose’s return to the NBA. Though Derrick Rose had a year-long hiatus to recover from his ACL injury, his comeback was wowed through this signature shoe. The Adiprene technology in the crash pad is strategically on the heel to provide impact protection. The SprintFrame technology on the heel counter holds the foot securely. The EVA foam delivers a smooth heel-to-toe transition. Cushion. For heel lockdown and stability, the SprintFrame technology of the Adidas D Rose 4 is strategically incorporated in the heel counter. It helps keeping the heel in its place to avoid injuries. This lightweight technology makes the feet sit low, enhancing the shoe’s court-feel. The Adiprene technology is the blue circular crash pad glued to the midsole to support the heel. It absorbs impact and protects the heel from stress. The rest of the midsole is made of full EVA foam that provides cushion to the entire feet. This foam also provides flexibility to the shoe, ultimately contributing to the multidirectional footwork of the wearer. Traction. The impressive performance of the Adidas D Rose 4 is due in part to its multidirectional herringbone pattern on the outsole. It has a good grip on the court, according to many reviewers. When used outdoors, the flat and thick rubber outsole can sustain rough plays and will remain durable. It is as well a non-scuffing outsole; it does not leave marks on the floors of indoor basketball gyms. Length and Width. New buyers are advised by most reviewers to go true to size when buying The Adidas D Rose 4. It is known that the D Rose shoe line comes in the standard width and length. Lockdown. The Adidas D Rose 4 utilizes a simple lace-up system. To achieve a more secure lockdown, the flat laces can be adjusted. Adding to the comfort is the Geofit technology used in the inner collar of the shoe and tongue. It is a thick foam padding that conforms with the ankle, giving more grip, support and comfort. The upper of the Adidas D Rose 4 is made of synthetic leather. The leather has perforations that aid in wicking away moisture. The removable polyurethane insole has the D Rose logo printed on it. The insole provides a good amount of flexibility, bounciness, and firmness to the shoe. 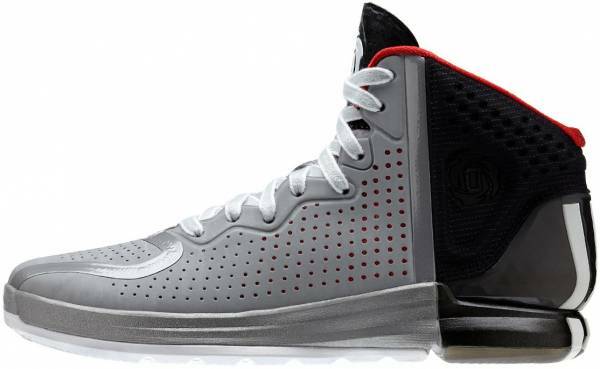 The Adidas D Rose 4 is a mid-top shoe with a two-tone design. The adidas callout and logo is located in the forefoot area. The famous three stripes are in the heel counter running through the outsole. To represent the technologies used in the shoe model, SPRINTWEB and ADIPRENE callouts are printed on the lateral side. As a signature shoe, it has a DERRICK ROSE callout in the toe cap area. The logo of Derrick Rose is neatly placed on the tongue. There is another Derrick Rose logo on the lateral side, which is made of 3M and glows in the dark. The strip that divides the forefoot from the rearfoot represents the distinct on- and off-court characteristics of Derrick Rose. The Adidas D Rose 4 is not only a signature shoe. In an interview with Adidas Head Designer Rob Lee, the logo has a deeper meaning to it. The three petals of the rose symbolize Rose’s three older brothers. Growing up in Chicago, they made sure he will be in the right path by focusing in basketball. The rough edges of the petals imply how aggressive Rose is in the game. In the center is the number 1 inside the letter D. Though the number is Rose’s jersey number, it actually represents his mother. He recognizes the impact of his mother on his basketball career. For Derrick Rose, his shoe line is very special to him. He has worked with the Adidas team meticulously to produce the best in every shoe. The logo also reminds him of his family, basketball, and the City of Chicago.